Monoclonal antibodies acting on the calcitonin gene-related peptide or on its receptor are new drugs to prevent migraine. Four monoclonal antibodies have been developed: one targeting the calcitonin gene-related peptide receptor (erenumab) and three targeting the calcitonin gene-related peptide (eptinezumab, fremanezumab, and galcanezumab). The aim of this document by the European Headache Federation (EHF) is to provide an evidence-based and expert-based guideline on the use of the monoclonal antibodies acting on the calcitonin gene-related peptide for migraine prevention. The guideline was developed following the Grading of Recommendation, Assessment, Development, and Evaluation (GRADE) approach. The working group identified relevant questions, performed systematic review and analysis of the literature, assessed the quality of available evidence, and wrote recommendations. Where the GRADE approach was not applicable, expert opinion was provided. We found low to high quality of evidence to recommend eptinezumab, erenumab, fremanezumab, and galcanezumab in patients with episodic migraine and medium to high quality of evidence to recommend erenumab, fremanezumab, and galcanezumab in patients with chronic migraine. For several clinical questions, there was not enough evidence to provide recommendations using the GRADE approach and recommendations relied on experts’ opinion. Monoclonal antibodies acting on the calcitonin gene-related peptide are new drugs which can be recommended for migraine prevention. Real life data will be useful to improve the use of those drugs in clinical practice. Migraine is a very common headache disorder affecting around 15% of adult subjects [1–3]. It is ranked as the second most disabling disease amongst all diseases globally . Migraine may be associated with significant morbidity and considerable negative impact on quality of life . Some patients may treat their migraine attacks with drugs to relieve pain but in some patients because of frequency, severity and impact on quality of life, preventive treatment is required to reduce the occurrence of acute attacks and the need of medications to relieve the pain. Many years have passed since the first mechanism-based drug, methysergide, was introduced for migraine treatment . Over the course of years, the use of this drug was dismissed because of safety profile. Other drugs, including calcium-channel antagonists, antidepressants, antiepileptics, anti-hypertensives developed for indications other than migraine entered the field based on clinical studies [6–9]. However, efficacy is often insufficient and there is a latency between initiation of the drug and clinical effect. Poor tolerability and side effects are important limitations of available preventive treatments. Additionally, migraineurs seem to be more sensitive to side-effects than patients suffering from other diseases . Those factors are the main reasons for medication discontinuation and poor adherence which is very often observed with available treatments [11–13]. Adherence to treatment is only 20% after one year . Additionally, comorbidities limit the possibility of using prophylactic drugs in some patients. We have now four monoclonal antibodies (mAbs) available acting on the calcitonin gene-related peptide (CGRP) pathway which can be used for migraine prevention: one targeting the CGRP receptor (erenumab) and three targeting the CGRP peptide (eptinezumab, fremanezumab, and galcanezumab) [15–17]. Those new treatments are migraine specific whereas all the other available preventive drugs were developed for indications other than migraine and have an unclear mechanism of action considering migraine pathophysiology. Furthermore, CGRP mAbs seem to have very favorable side-effects profile. The European Headache Federation (EHF) initiated this project to provide clinical guidance on the use of the CGRP mAbs. The aim of this guideline is to provide evidence-based and expert-based guidance to clinicians for the management of episodic migraine (EM) and chronic migraine (CM) with CGRP mAbs. The EHF identified an expert Panel consisting of seven members; all members are physicians. The Guideline was developed according to the Grading of Recommendations, Assessment, Development and Evaluation (GRADE) system  as the method of choice to establish recommendations. Members of the Panel group developed clinical questions which were considered important for the management of patients with EM or CM with CGRP mAbs. Clinical questions were developed, where possible, according to the GRADE system as Patients; Intervention; Comparison and Outcome (PICO) questions . For PICO questions, statements were developed according to the GRADE approach. Outcomes rated as important or critical by members of the group were considered. For questions where the GRADE approach was not applicable recommendations were developed as expert statements. The search strategy was formulated taking into account the PICO and clinical questions. 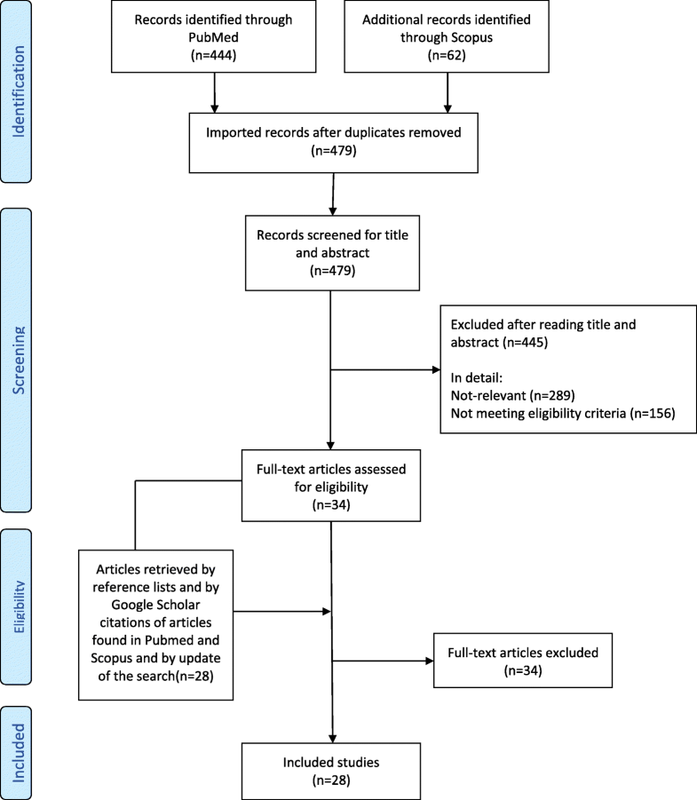 A systematic review of the literature was performed according to the Preferred Reporting Items for Systematic Reviews and Meta-Analyses (PRISMA) guidelines . We identified key papers on the use CGRP mAbs in patients with migraine. An initial literature search included all papers indexed on PubMed and Scopus, from inception to April 2, 2018. The systematic literature search was repeated at the end of the consensus procedure to include all relevant papers published until November 2018. The following search string was used in both databases: “migraine OR headache AND (CGRP OR eptinezumab OR erenumab OR fremanezumab OR galcanezumab)”. Two investigators independently screened the titles and abstracts of the publications identified to verify study eligibility. Literature screening was conducted in two steps. In the first step, studies were excluded after reading the title and the abstract for clear exclusion criteria. For studies that passed the first step, the full text was assessed to decide about inclusion/exclusion. Disagreements were resolved by consensus. The reference lists and Google Scholar citations of the selected articles were also screened. The reasons for exclusion were recorded and summarized. To summarize the search results, a data extraction sheet was developed including the information of interest. Papers retrieved from the literature search as well as summary tables were shared among the panelists. A general description of the study was extracted for each publication. We extracted first author name and year of publication, full citation, study design and setting, study period, number of included patients, diagnostic criteria for migraine, migraine type, treatment type, duration of observations and treatments, study results. Data extraction was performed by a single researcher (SS) and double checked. Inclusion and exclusion criteria were selected prior to the literature search. We included 1) observational (prospective) and intervention studies in which an CGRP mAb was assessed as possible treatment strategy for migraine prevention; 2) studies published in English or in other languages if a reliable translation could be obtained; 3) reliable criteria to diagnose migraine; 4) treatment for migraine prevention with any form of CGRP mAb; 5) reporting any outcome referring to migraine frequency, severity, duration, disability, or use of drugs to treat the acute attacks before and after treatment or in treated and untreated patients. Whenever different studies referring to the same population of patients were available we included the study reporting the outcome of interest for the specific analysis or with the largest population or with the longest follow-up; different studies can be eligible for different questions. We excluded studies 1) with observational designs not reporting outcomes with treatment or not comparing at least two treatment strategies; 2) performed in patients with headache other than migraine; 3) not reporting information on the outcomes selected for the PICO and clinical questions; 4) published only in the form of abstracts or presented at conferences only. For each of the selected studies one author (SS) addressed the quality of evidence. Quality of evidence was addressed for single studies and for selected outcomes according to the GRADE approach . Randomized trials were considered as high quality of evidence but their quality was downgraded in the case of study limitations such as lack of allocation concealment, lack of blinding, incomplete accounting for patients and outcome events, selective outcome reporting bias, or other limitations such as inadequate sample or lack of sample size calculation . Observational studies were considered as low quality of evidence but their quality was upgraded in the case of large magnitude effects, dose-response gradient, if plausible confounding can increase confidence in the estimate or other considerations . Final quality of evidence was rated as high, medium, low or very low based on study design, study limitations, inconsistency, indirectness, imprecision, publication bias, effect size, dose response and confounding . Summary of findings tables were drafted using the GRADE pro statistical software considering all the outcomes considered important or critical. For the analysis of extracted data we used R statistical software. Data analysis was performed on a random-effects basis and results were summarized as risk ratio (RR) and 95% confidence intervals (CI). The consensus process was performed according to the Delphi method . Development of the consensus statement was organized into rounds. In each round, panelists were instructed not to discuss among themselves and to send their feedback only to the facilitator (SS). The facilitator collected all the answers and issued for each round an anonymized report with comments. Rounds were repeated until a final consensus was reached among Panel members. Strength (strong or weak) and direction (for or against) of recommendation were determined on basis of balance between desirable and undesirable effects, quality of evidence, values and preferences and costs . If GRADE was not applicable, an ungraded good practice statement based on experts’ opinions was given, according to the available level of evidence. We identified 28 studies eligible to be considered in the present guidelines (Fig. 1) [23–50]. Fourteen of the selected studies (Tables 1 and 2) were phase II or III randomized clinical trials (RCTs) reporting data on safety or efficacy of the CGRP mAbs [26, 27, 31–36, 41–45, 50]; 14 additional studies were post-hoc or pooled analyses from the RCTs, open label-extension of the RCTs, or open label studies [23–25, 28–30, 37–40, 46–49]. Risk of bias summary for the selected studies is reported in Fig. 2. 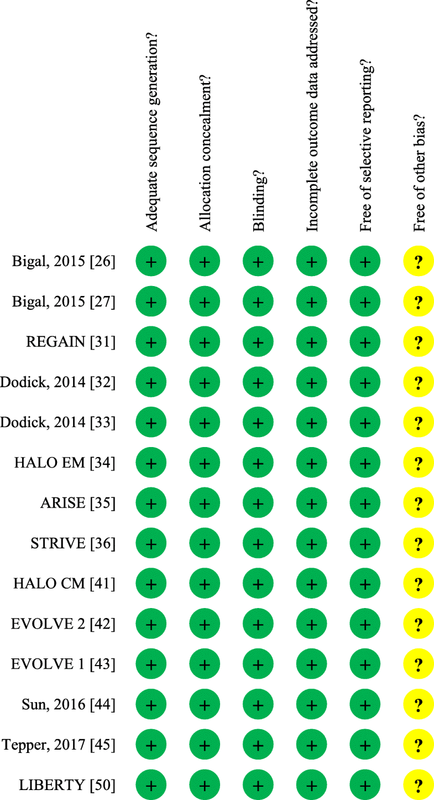 Certainty assessment of outcomes for studies in EM and CM is reported in Tables 3 and 4. Recommendations related to the use of CGRP mAbs for prevention of EM and CM are reported in Table 5. In patients with EM, is preventive treatment with CGRP mAbs as compared to placebo, effective and safe? Intervention: any preventive CGRP mAb. Outcome: reduction in days of migraine or headache, reduction in the use of acute attack medication, improvement in function, responder ratio (patients with > 50% reduction in migraine or headache days), serious adverse events (SAEs), mortality (grade of importance: critical). We found 14 eligible studies which evaluated whether treatment with CGRP mAbs as compared to placebo is effective and safe [26, 27, 31–36, 41–45, 50]. Among the eligible studies one was on eptinezumab , five studies on erenumab [35, 36, 44, 45, 50], four studies on fremanezumab [26, 27, 34, 41], and four studies on galcanezumab [31, 33, 42, 43]. One study phase IIIb study on erenumab was not included in the PICO question 1 because it included only patients with previous drug failure . Summary of findings for treatment with eptinezumab quarterly injection compared with placebo for prevention of EM is provided in Table 6. Treatment with eptinezumab 1000 mg reduces the number of migraine days slightly compared with placebo. Treatment with eptinezumab 1000 mg results in a small possibly unimportant effect in reduction in use of acute attack medication compared with placebo (statistical significance of the differences not tested). Treatment with eptinezumab 1000 mg results in a small possibly unimportant effect in improvement in function assessed by means of the HIT-6 score compared with placebo (statistical significance of the differences not tested). Treatment with eptinezumab 1000 mg results in a small possibly unimportant effect in at least 50% reduction of days of migraine compared with placebo. Treatment with eptinezumab 1000 mg results in a small possibly unimportant effect in serious adverse events occurrence compared with placebo. No deaths occurred during the double-blind treatment phase of the trial. A phase II exploratory RCT evaluated the safety and the efficacy of eptinezumab in subjects aged 18–55 years with EM and attack frequency between 5 and 14 days per month . Patients were randomized to a single intravenous injection of eptinezumab 1000 mg or placebo. At weeks 9–12, there was no reduction in migraine days in the eptinezumab compared to the placebo group (mean difference [MD] -1.0; 95% confidence interval [CI] -2.1 to + 0.2). There was a reduction of migraines with acute migraine treatment in the eptinezumab compared to the placebo group (MD -10.4%; 95% CI -20.5 to − 0.2). There was a non-significant improvement in the Headache Impact Test 6 (HIT-6) score in the eptinezumab group compared to the placebo group (MD -2.4; 95% CI -5.5 to 0.7). The at least 50% responder rate was similar in the eptinezumab and in the placebo group (MD 10%; 95% CI -4 to 24%). In the trial, there were 6 SAEs (1 in the placebo group and 5 SAEs in two patients in the erenumab group); the rate of SAEs was 2.4% in the eptinezumab and 1.2% in the placebo group. All the events were deemed to be unrelated to eptinezumab. No deaths were reported. Summary of findings for treatment with erenumab 70 mg monthly injection compared with placebo for prevention of EM is provided in Table 7 and with erenumab 140 mg monthly injection in Table 8. Treatment with erenumab 70 mg results in reduction in migraine days compared with placebo. Treatment with erenumab 70 mg results in reduction in use of acute attack medication compared with placebo. Treatment with erenumab 70 mg results in improvement in functional MPFID everyday-activities score compared with placebo. Treatment with erenumab 70 mg results in at least 50% reduction of days of migraine compared with placebo. Treatment with erenumab 70 mg results in a small possibly unimportant effect in serious adverse events occurrence compared with placebo. Treatment with erenumab 140 mg results in reduction in migraine days compared with placebo. Treatment with erenumab 140 mg results in reduction in number of days of use of acute attack medication compared with placebo. Treatment with erenumab 140 mg results in improvement in functional MPFID everyday-activities score compared with placebo. Treatment with erenumab 140 mg results in at least 50% reduction of days of migraine compared with placebo. Treatment with erenumab 140 mg results in a small possibly unimportant effect in serious adverse events occurrence compared with placebo. A phase II RCT evaluated the safety and the efficacy of erenumab in subjects aged 18–60 years with EM and attack frequency between 4 and 14 days per month . Patients were randomized to monthly subcutaneous injections of erenumab 70 mg or placebo for 3 months. At 3 month, there was a reduction in monthly migraine days in the erenumab 70 mg compared to placebo group (least squares mean difference [LSMD] –1.1 days; 95% CI –2.1 to − 0.2; P = 0.021). There was a reduction in the number of days using acute medication in the erenumab 70 mg compared to the placebo group (LSMD –1.2; 95% CI –2.0 to − 0.3; P = 0.006). The at least 50% responder rate was greater in the erenumab 70 mg group compared to the placebo group (46% versus 30%; odds ratio [OR] 2.0; 95% CI 1.2 to 3.4; P = 0.011). In the trial, there were 2 SAEs; the rate of SAEs was 0.9% in erenumab 7 mg and 0.9% in erenumab 70 mg group. All the events were deemed to be unrelated to erenumab. No deaths were reported. A phase III RCT, the STRIVE, evaluated the efficacy of erenumab in subjects aged 18–65 years with EM and attack frequency between 4 and 14 days per month . Patients were randomized to monthly subcutaneous injections of erenumab 70 mg, erenumab 140 mg or placebo for 6 months. At 4–6 months, there was a reduction in monthly migraine days in the erenumab 70 mg (LSMD -1.4; SE -1.9 to − 0.9) and in the erenumab 140 mg (LSMD -1.9; SE -2.3 to − 1.4) groups compared to the placebo group. There was a reduction in the monthly number of days using acute medications in the erenumab 70 mg (LSM -0.9; SE -1.2 to − 1.6) and in the erenumab 140 mg (LSM -1.4; SE -1.7 to − 1.1) groups compared to the placebo group. There was an improvement in the monthly migraine Physical Function Impact Diary (MPFID) everyday-activities score in the erenumab 70 mg (LSMD -2.2; 95% CI -3.3 to − 1.2) and in the erenumab 140 mg (LSMD -2.6; 95% CI-3.6 to − 1.5) groups compared to the placebo group. There was an improvement in the monthly MPFID physical-impairment score in the erenumab 70 mg (LSMD -1.9; 95% CI -3.0 to − 0.8) and in the erenumab 140 mg (LSMD -2.4; 95% CI -3.4 to − 1.4) groups compared to the placebo group. The at least 50% responder rate was greater in the erenumab 70 mg (OR 2.13; 95% CI 1.52 to 2.98) and in the erenumab 140 mg (OR 2.81; 95% CI 2.01 to 3.94) groups compared to the placebo group. In this trial, there were 21 SAEs; the rate of SAEs was 2.5% in the erenumab 70 mg, 1.9% in the erenumab 140 mg, and 2.2% in the placebo group. SAEs were not related to study drug. No deaths were reported. A phase III RCT, the ARISE, evaluated the efficacy of erenumab in subjects aged 18–65 years with EM and attack frequency between 4 and 14 days per month . Patients were randomized to monthly subcutaneous injections of erenumab 70 mg or placebo for 3 months. At week 12, there was a significant reduction in the monthly migraine days in the erenumab compared to the placebo group (LSMD -1.0; 95% CI -1.6 to − 0.5; P < 0.001). There was a significant reduction in the number of days using acute migraine-specific medication (triptan/ergot) in the erenumab compared to the placebo group (LSMD -0.6; SE -1.0 to − 0.2; P = 0.002). There was a significant improvement in modified monthly MIDAS total scores in the erenumab compared to the placebo group (LSMD -1.7; SE -3.1 to − 0.3; P = 0.021). The at least 50% responder rate per month was greater in the erenumab compared to the placebo group (OR 1.59; 95% CI 1.12 to 2.27; P = 0.010). In this trial, there were 8 SAEs; the rate of SAEs was 1.1% in the erenumab 70 mg and 1.7% in the placebo group. No deaths were reported. Summary of findings for treatment with fremanezumab 225 mg monthly injection compared with placebo for prevention of EM is provided in Table 9 and with fremanezumab 675 mg quarterly injection in Table 10. Treatment with fremanezumab 225 mg results in reduction in migraine days compared with placebo. Treatment with fremanezumab 225 mg results in reduction in use of acute attack medication compared with placebo. Treatment with fremanezumab 225 mg results in improvement in functional MIDAS score compared with placebo. Treatment with fremanezumab 225 mg results in at least 50% reduction of days of migraine compared with placebo. Treatment with fremanezumab 225 mg results in small possibly unimportant effect in serious adverse events occurrence compared with placebo. No deaths occurred during the double-blind treatment phase of the trials. Treatment with fremanezumab 675 mg results in reduction in migraine days compared with placebo. Treatment with fremanezumab 675 mg results in reduction in use of acute attack medication compared with placebo. Treatment with fremanezumab 675 mg results in improvement in functional MIDAS score compared with placebo. Treatment with fremanezumab 675 mg results in at least 50% reduction of days of migraine compared with placebo. Treatment with fremanezumab 675 mg results in small possibly unimportant effect in serious adverse events occurrence compared with placebo. One death occurred in fremanezumab 675 mg group, and no deaths occurred in the placebo group during the double-blind treatment phase of the trials. Treatment with fremanezumab 675 mg results in small possibly unimportant effect in mortality compared with placebo. A phase II RCT evaluated the safety and the efficacy of fremanezumab in subjects aged 18–65 years with EM and migraine day frequency between 8 and 14 days per month . Patients were randomized to subcutaneous injections every 28 days of fremanezumab 225 mg, fremanezumab 675 mg or placebo for three treatment cycles. At week 9–12, there was a reduction in migraine days in the fremanezumab 225 mg (LSMD -2.81; 95% CI –4.07 to − 1.55; p < 0.0001) and in the fremanezumab 675 mg (LSMD –2.64; 95% CI–3.90 to − 1.38; P < 0.0001) groups compared to the placebo group. There was a reduction in the number of days with acute medications in the fremanezumab 225 mg (LSMD 1.76; 95 CI -2.86 to − 0.66; P = 0.0018) and in the fremanezumab 675 mg (LSMD 1.70; 95 CI -2.80 to − 0.60; P = 0.0026) groups compared to the placebo group. There was an improvement in Migraine Disability Assessment (MIDAS) scores in the fremanezumab 225 mg (LSMD -14.50; 95% -26.79 to − 2.20; P = 0.021) and in the fremanezumab 675 mg (LSMD -15.20; 95% -27.62 to − 2.78; P = 0.017) groups compared to the placebo group. The at least 50% responder rate was 28% in the placebo group, 53% in the fremanezumab 225 mg group (P = 0.0005) and 59% in the fremanezumab 675 mg group (P < 0.0001). In this trial, there were 4 SAEs; the rate of SAEs was 2% in the fremanezumab 225 mg and 2% in the fremanezumab 675 mg group. All the events were deemed to be unrelated to fremanezumab. No SAEs were reported in the placebo group. No deaths were reported. A phase III RCT, the HALO EM, evaluated the safety and the efficacy of fremanezumab in subjects aged 18–70 years with EM and attack frequency between 6 and 14 days per month . Patients were randomized to monthly subcutaneous injections of fremanezumab 225 mg, to quarterly fremanezumab 675 mg, or placebo for 3 months. At 3 months, there was a significant reduction in monthly migraine days in the fremanezumab 225 mg (LSMD –1.5; 95% CI –2.01 to − 0.93; P < 0.001) and in the fremanezumab 675 mg (LSMD –1.3; 95% CI –1.79 to − 0.72; P < 0.001) groups compared to the placebo group. There was a significant reduction in the monthly number of days using acute medication in the fremanezumab 225 mg (LSMD -1.4; 95% CI –1.84 to − 0.89; P < .001) and in the fremanezumab 675 mg (LSMD –1.3; 95% CI –1.76 to − 0.82; P < 0.001) groups compared to the placebo group. There was an improvement in mean MIDAS scores in the fremanezumab 225 mg (LSMD –7.0; 95% CI –10.51 to − 3.53; P < 0.001) and in the fremanezumab 675 mg (LSMD –5.4; 95% CI –8.90 to − 1.93; P = 0.002) groups compared to the placebo group. The at least 50% responder rate was higher in the fremanezumab 225 mg (difference vs placebo, 19.8%; 95% CI 12.0%–27.6%; P < 0.001) and in the fremanezumab 675 mg (difference vs placebo, 16.5%; 95% CI 8.9%–24.1%; P < 0.001) groups compared to the placebo group. In this trial there were 13 SAEs; the rate of SAEs was 1.0% in the fremanezumab 225 mg, 1.0% in the fremanezumab 675 mg, and 2.4% in the placebo group. One death occurred in the fremanezumab 675 mg group; the event was considered unrelated to treatment. Summary of findings for treatment with galcanezumab 120 mg monthly injection (240 mg loading dose) compared with placebo for prevention of EM is provided in Table 11 and with galcanezumab 240 mg monthly injection in Table 12. Treatment with galcanezumab 120 mg results in reduction in migraine days compared with placebo. Treatment with galcanezumab 120 mg results in reduction in use of acute attack medication compared with placebo. Treatment with galcanezumab 120 mg results in improvement in functional MSQ RFR score compared with placebo. Treatment with galcanezumab 120 mg results in at least 50% reduction of days of migraine compared with placebo. Treatment with galcanezumab 240 mg results in reduction in migraine days compared with placebo. Treatment with galcanezumab 240 mg results in reduction in use of attack medication compared with placebo. Treatment with galcanezumab 240 mg results in improvement in functional MSQ RFR score compared with placebo. Treatment with galcanezumab 240 mg results in at least 50% reduction of days of migraine compared with placebo. Treatment with galcanezumab 240 mg results in a small possibly unimportant effect in serious adverse events occurrence compared with placebo. Very low certainty: We have very little confidence in the effect estimate: The true effect is likely to be substantially different from the estimate of effect. A phase II RCT evaluated the safety and the efficacy of galcanezumab in subjects aged 18–65 years with EM and attack frequency between 4 and 14 days per month . Patients were randomized to subcutaneous injections every two weeks of galcanezumab 150 mg or placebo for 3 months. No concomitant preventive medication was allowed. At 9–12 week, there was a reduction in the number of migraine days in the galcanezumab compared to the placebo group (LSMD –1.2; 90% CI –1.9 to − 0.6). There were more at least 50% responder rate in the galcanezumab compared to the placebo group (OR 2.88, 90% CI 1.78–4.69). In this trial, there were 6 SAEs; the rate of SAEs was 1.9% in the galcanezumab and 3.6% in the placebo group. The events were considered unrelated to treatment. No deaths occurred in the study. A phase II RCT, the EVOLVE-2, evaluated the efficacy of galcanezumab in subjects aged 18–65 years with EM and attack frequency between 4 and 14 days per month . Patients were randomized to subcutaneous injection once a month of galcanezumab 5, 50, 120, or 300 mg or placebo for 3 months. No concomitant preventive medication was allowed. At 9–12 week, there was a greater improvement in migraine days in the galcanezumab 120 mg (− 4.8, 90% Bayesian credible interval [BCI], − 5.4 to − 4.2) compared to the placebo group (− 3.7, 90% BCI, − 4.1 to − 3.2). There was a greater improvement from baseline in the HIT-6 score in the galcanezumab, 120 mg (LSMD − 10.0; 95% CI, − 12.2 to − 7.7; P = 0.04) compared to placebo group (LSMD − 7.3; 95% CI − 8.8 to − 5.7). In this trial, there were 4 SAEs; the rate of SAEs was 1.5% in the galcanezumab and 0 in the placebo group. The events were considered unrelated to treatment. No deaths occurred in the study. A phase III RCT, the EVOLVE-1, evaluated the safety and the efficacy of galcanezumab in subjects aged 18–65 years with EM and attack frequency between 4 and 14 days per month . Patients were randomized to monthly subcutaneous injections of galcanezumab 120 mg (with a loading dose of 240 mg), galcanezumab 240 mg or placebo for 6 months. At 1–6 month, there was a reduction in monthly migraine days averaged over the entire study period in the galcanezumab 120 mg (LSMD -1.9; SE -2.5 to − 1.4; P < 0.001) and in the galcanezumab 240 mg (LSMD -1.8; SE -2.3 to − 1.3; P < 0.001) group compared to placebo group. There was a reduction in the monthly number of migraine days using acute medication in the galcanezumab 120 mg (LSMD -1.8; SE -2.3 to − 1.3; P < 0.001) and in the galcanezumab 240 mg (LSMD -1.6; SE -2.1 to − 1.1; P < 0.001) group compared to placebo group. There was an improvement in the MIDAS total score in the galcanezumab 120 mg (LSMD − 21.2; SE 1.7; P < 0.001) and in the galcanezumab 240 mg (LSMD − 20.1; SE 1.7; P < .002) groups compared to placebo group. The at least 50% responder rate was greater in galcanezumab 120 mg (OR 2.6; 95% CI 2.0–3.4; P < 0.001) and in galcanezumab 240 mg (OR 2.5; 95% CI 1.9–3.2; P < 0.001) groups compared to placebo group. In this trial, there were 12 SAEs in 11 patients; the rate of SAEs was 2.9% in the galcanezumab 120 mg, 0 in the galcanezumab 240 mg, and 1.2% in the placebo group. The events were considered unrelated to treatment. No deaths occurred in the study. Available studies indicated that erenumab, fremanezumab, and galcanezumab are effective for prevention in patients with EM. They reduce the number of headache or migraine days, reduce the number of days using acute medications, improve disability. Evidence for erenumab, fremanezumab, and galcanezumab is based on phase II and III RCTs. For eptinezumab benefits are not entirely clear and improvement was significant only in the reduction of medications used for acute attacks; additionally, evidence is based on an exploratory phase II RCT. Eptinezumab is administered via intravenous injection while erenumab, fremanezumab, and galcanezumab are administered via subcutaneous injections. Ease of use represents a potential advantage as CGRP mAbs offer the convenience and adherence benefits of monthly or quarterly dosing allowing avoidance of the daily pill burden. Treatment effect was evident after the first injection and patients continued to improve within the fifth month of treatment [41–43]. The quick onset of action is a potential advantage of CGRP mAbs as compared to conventional treatments. Reduction in migraine days with CGRP mAbs were only modest and ranged from 1 to 2 when compared to placebo. However, the absolute effect of treatment was larger considering also the placebo effect. Perhaps, more clinically significant is the at least 50% responder rate, which was consistently increased with treatment in a clinically meaningful way. A proportion of patients may have a 100% response rate to CGRP mAbs . The open-label extension of the phase II RCT of erenumab reported low discontinuation rates  which is in contrast to current migraine prophylactics that are associated with high discontinuation rates [8, 51, 52]. Post-hoc analyses of the RCTs indicated that treatment with fremanezumab is associated with improved normal function performance on headache free days  and that treatment with galcanezumab is associated with overall functional improvement . At the moment, it cannot be determined whether unique patient populations will have a response to a specific drug. Data from RCTs indicated that the CGRP mAbs are safe. No relevant SAEs were registered. One death occurred in the phase III RCT on fremanezumab  and one death occurred in the open label extension trial on erenumab . Both deaths were considered unrelated to the study drugs. However, it should be noted that further data from the real-life setting are needed to support safety and to provide information on the long-term use. In patients with CM, is preventive treatment with CGRP mAbs as compared to placebo, effective and safe? Outcome: reduction in days of migraine or headache, reduction in the use of acute attack medication, improvement in function, responder ratio (patients with > 50% reduction in migraine or headache days), serious adverse events, mortality (grade of importance: critical). We found four eligible studies which evaluated whether treatment with CGRP mAbs as compared to placebo is effective and safe [26, 31, 41, 45]. Among the eligible studies one study was on erenumab , two studies on fremanezumab [26, 41], and one on galcanezumab . Summary of findings for treatment with erenumab 70 mg monthly injection compared with placebo for prevention of CM is provided in Table 13 and with erenumab 140 mg monthly injection in Table 14. Treatment with Erenumab 70 mg reduces monthly migraine days slightly compared to placebo. Treatment with Erenumab 70 mg reduces monthly acute treatment days slightly compared to placebo. Treatment with Erenumab 70 mg results in at least 50% reduction of monthly migraine days compared to placebo. Treatment with Erenumab 70 mg results in a small unimportant increase of serious adverse event occurrence compared to placebo. Treatment with Erenumab 140 mg reduces monthly migraine days slightly compared to placebo. Treatment with Erenumab 140 mg reduces monthly acute treatment days slightly compared to placebo. Treatment with Erenumab 140 mg results in at least 50% reduction of monthly migraine days compared to placebo. Treatment with Erenumab 140 mg results in a small unimportant increase of serious adverse event occurrence compared to placebo. CI Confidence interval, RR Risk ratio, RCT Randomized controlled trial; aDowngraded once due to inconsistency. A phase II RCT evaluated the safety and the efficacy of erenumab in subjects aged 18–65 years with CM . Patients were randomized to monthly subcutaneous injection of erenumab 70 mg, erenumab 140 mg or placebo for 3 months. At weeks 9–12, there was a reduction in monthly migraine days in the erenumab 70 mg (LSMD -2.5; SE -3.5 to − 1.4; P < 0.0001) and in the erenumab 140 mg (LSMD -2.5; SE -3.5 to − 1.4; P < 0.0001) groups compared to placebo group. There was a reduction in monthly number of days using migraines-specific medication in the erenumab 70 mg (LSMD-1.9; SE -2.6 to − 1.1; P < 0.0001) and in the erenumab 140 mg (LSMD -2.6; SE -3.3 to − 1.8; P < 0.0001) groups compared to the placebo group. The at least 50% responder rate was greater in the erenumab 70 mg (40% versus 23%; OR 2.2; 95% CI 1.5 to 3.3; P = 0.0001) and in the erenumab 140 mg (41% versus 23%; OR 2.3; 95% CI 1.6 to 3.5; P < 0.0001) groups compared to the placebo group. In this trial, there were 15 SAEs; the rate of SAEs was 3% in erenumab 70 mg, 1% in erenumab 140 mg, and 2% in the placebo group. No deaths were reported. Summary of findings for treatment with fremanezumab 675 mg quarterly injection compared with placebo for prevention of CM is provided in Table 15 and with fremanezumab 225 mg monthly injection (675 loading dose) in Table 16. Treatment with Fremanezumab 675 mg reduces monthly headache days slightly compared to placebo. Treatment with Fremanezumab 675 mg reduces monthly acute treatment days slightly compared to placebo. Treatment with fremanezumab 675 mg improves functional HIT-6 score slightly compared to placebo. Treatment with Fremanezumab 675 mg results in at least 50% reduction of monthly headache days compared to placebo. Treatment with Fremanezumab 675 mg results in an unimportant reduction of serious adverse event occurrence compared to placebo. Treatment with Fremanezumab 675/225 mg reduces monthly headache days slightly compared to placebo. Treatment with Fremanezumab 675/225 mg reduces monthly acute treatment days slightly compared to placebo. Treatment with fremanezumab 675/225 mg improves functional HIT-6 score slightly compared to placebo. Treatment with Fremanezumab 675/225 mg results in at least 50% reduction of monthly headache days compared to placebo. Treatment with Fremanezumab 675/225 mg results in an unimportant reduction of serious adverse event occurrence compared to placebo. A phase II RCT evaluated the safety, the tolerability, and the efficacy of fremanezumab in subjects aged 18–65 years with CM . Patients were randomized to three 28-day treatment cycles of subcutaneous injections of fremanezumab 225 mg (loading dose 675 mg), fremanezumab 900 mg or placebo. At weeks 9–12, there was a reduction in moderate to severe headache days in the fremanezumab 675/225 mg (LSMD -1.84; 95% CI -3.54 to − 0.14; P = 0.0345) and in the fremanezumab 900 mg (LSMD -1.96; 95% CI -3.66 to − 0.26; P = 0.0237) groups compared to placebo group. There was a reduction in number of days using acute medication in the fremanezumab 900 mg (LSMD -2.04; 95% CI -3.9 to − 0.2; P = 0.027) group compared to placebo group. The at least 50% responder rate considering moderate to severe headaches was greater in the fremanezumab 675/225 mg (OR 2.44; 95% CI 1.3 to 4.5; P = 0.004) and in the fremanezumab 900 mg (OR 2.97; 95% CI 1.6 to 5.5; P = 0.013) groups compared to placebo group. In this trial, there were 4 SAEs; the rate of SAEs was 1% in the fremanezumab 675/225 mg, 2% in the fremanezumab 900 mg, and 1% in the placebo group. All the events were deemed to be unrelated to fremanezumab. No deaths were reported. A phase III RCT, the HALO CM, evaluated the efficacy of fremanezumab in subjects aged 18–70 years with CM . Patients who had failed 2 of four clusters of preventive treatments were excluded; migraine preventive drugs were permitted during the study in up to 30% of included patients. Patients were randomized to monthly subcutaneous injections of fremanezumab 225 mg (loading dose of 675 mg), to quarterly fremanezumab 675 mg, or placebo for 3 months. During 12-week period, there was a reduction in the average number of headache days per month in the fremanezumab 675 mg (LSMD -1.8; SE 0.3; P < 0.001) and in the fremanezumab 675/225 mg (LSMD -2.1; SE 0.3; P < 0.001) groups compared to placebo group. There was a reduction in the monthly number of days using acute medication in the fremanezumab 675 mg (LSMD -1.8; SE 0.3; P < 0.001) and in the fremanezumab 675/225 mg (LSMD -2.3; SE 0.3; P < 0.001) groups compared to placebo group. There was an improvement in the HIT-6 score in the fremanezumab 675 mg (LSMD -1.9; SE 0.5; P < 0.001) and in the fremanezumab 675/225 mg (LSMD -2.4; SE 0.5; P < 0.001) groups compared to placebo group. The at least 50% responder rate was increased in the fremanezumab 675 mg (38%) and in the fremanezumab 675/225 mg (41%) groups compared to placebo group (18%; P < 0001). In this trial, there were 14 SAEs; the rate of SAEs was < 1% in the fremanezumab 675 mg, 1% in the fremanezumab 675/225 mg, and 2% in the placebo group. One SAE lead to discontinuation of the trial. One death occurred in the fremanezumab 675 mg group and was deemed to be unrelated to fremanezumab. Summary of findings for treatment with galcanezumab 120 mg monthly injection (240 mg loading dose) compared with placebo for prevention of CM is provided in Table 17 and with galcanezumab 240 mg monthly injection in Table 18. Treatment with Galcanezumab 120 mg reduces monthly migraine days slightly compared to placebo. Treatment with Galcanezumab 120 mg reduces monthly acute treatment days slightly compared to placebo. Treatment with Galcanezumab 120 mg improves functional MIDAS score compared to placebo. Treatment with Galcanezumab 120 mg mg results in at least 50% reduction of monthly headache days compared to placebo. Treatment with Galcanezumab 120 mg mg results in a possibly unimportant effect on serious adverse event occurrence compared to placebo. Treatment with Galcanezumab 240 mg reduces monthly migraine days slightly compared to placebo. Treatment with Galcanezumab 240 mg reduces monthly acute treatment days slightly compared to placebo. Treatment with Galcanezumab 240 mg does not improve functional MIDAS score significantly compared to placebo. Treatment with Galcanezumab 240 mg mg results in at least 50% reduction of monthly headache days compared to placebo. Treatment with Galcanezumab 240 mg mg results in a possibly unimportant effect on serious adverse event occurrence compared to placebo. A phase III RCT, the REGAIN, evaluated the efficacy of galcanezumab in subjects aged 18–65 years with CM . Patients were randomized to monthly subcutaneous injections of galcanezumab 120 mg (loading dose of 240 mg at baseline), galcanezumab 240 mg, or placebo for 3 months. During the 3-month period, there was a reduction in monthly migraine days in the galcanezumab 120 mg group (LSMD -2.1; 95% CI -2.9 to − 1.3) and with galcanezumab 240 mg (LSMD -1.9; 95% CI -2.7 to − 1.1) compared to placebo groups. There was a reduction in monthly number of days using acute medication use in the galcanezumab 240 mg (LSMD -2.0; 95% CI -2.8 to − 1.3) but not in galcanezumab 120 mg as compared to the placebo group. There was an improvement in the MIDAS score in the galcanezumab 120 mg (LSMD -8.7; 95% CI -16.4 to − 3.1) but not in galcanezumab 240 mg as compared to the placebo group. The at least 50% responder rate was increased in the galcanezumab 120 mg (OR 2.1; 95% CI 1.6–2.8) and in the galcanezumab 240 mg (OR 2.1; 95% CI 1.6–2.8) groups compared to placebo group. In this trial, there were 10 SAEs; the rate of SAE was 0.4% in the galcanezumab 120 mg, 1.8% in the galcanezumab 240 mg, and 0.7% in the placebo group. No deaths were reported. Available studies indicate that erenumab, fremanezumab, and galcanezumab are effective for prevention in patients with CM. They reduce the number of headache days, reduce the number of days using acute medications, improve disability, and are safe. For erenumab evidence is based on a phase II RCT which however was not a dose finding exploratory study but a RCT to assess safety and efficacy. For fremanezumab evidence is based also on phase II and on a phase III RCT while for galcanezumab it is based on a phase III RCT. Studies included patients with a long history of disease and those who had previously failed two or more preventive medications. The trials did not include patients with more refractory disease such as those who had not had a response to two clusters of preventive medications. When should treatment with CGRP mAbs be offered to patients with migraine? Characteristics of patients according to migraine duration and previous use of preventive drugs is reported in Tables 1 and 2. In all the trials, included patients had a long migraine history less than 15 years. RCTs included patients who had not tried any previous preventive strategy, patients who had failed or not tolerated other preventatives. Patients considered as drug-resistant where on the other hand excluded. Referring to the RCTs on EM, the phase II RCT on eptinezumab did not exclude patients according to previous failure of preventive drugs . All the others RCTs in EM excluded patients who failed 2 to 4 categories of preventive drugs. For erenumab, patients who had previous medication failure represented 26% to 40% [35, 36, 44], for fremanezumab they were 27–33% [27, 34] and for galcanezumab 18–19% [33–43]. A phase IIIb study, the LIBERTY trial, evaluated the efficacy of erenumab 140 mg monthly dose as compared to placebo in patients with EM who had been treated unsuccessfully (in terms of either efficacy or tolerability, or both) with between two and four preventive treatments . At 3 months, significantly more patients in the erenumab group than in the placebo group had a 50% or greater reduction from baseline in the mean number of monthly migraine days. Erenumab was also significantly more efficacious than placebo for all secondary endpoints, including improvements in migraine frequency, medication use, and functional outcomes. Referring to the RCTs on CM, the phase II RCT on erenumab, excluded patients who had no therapeutic response on an adequate trial of > 3 preventive medications . In the overall study population, 74% of patients had previously received preventive treatments ; among them, 48 to 50% of patients had failed ≥2 preventive drugs, 66 to 70% had failed > 1 preventive drug and 30 to 34% had no drug failure; 47 to 52% of patients had previous use of topiramate. OnabotulinumtoxinA injections for migraine prevention were prohibited during the study and for at least 4 months before the start of the baseline phase; 23 to 26% of patients had used onabotulinumtoxinA before study entry. MOH was explicitly allowed. Mean monthly acute migraine-specific drug use days was around 9. Treatment differences for erenumab versus placebo were numerically greater in patients with ≥1 or ≥ 2 failed preventive medications than in patients with no prior treatment failure, particularly for the 140 mg dose . The effect was attributable to a lower placebo effect in patients with prior medications failure than in patients without medications failure. The phase II and III RCTs on fremanezumab in CM excluded patients who had no therapeutic response of ≥2 preventive medications [26, 41]. The phase III study explicitly excluded patients with unremitting headaches (headaches for more than 80% of the time they were awake, and less than 4 days without headache per month); daily headache was acceptable if patients had headaches on less than 80% of the time they were awake on most days . In the study, 28 to 31% of patients had previous use of topiramate. In both trials, onabotulinumtoxinA injections were prohibited during the study and in the 4  or 6  months before study entry. In the phase III study, 13 to 18% of patients had used onabotulinumtoxinA before study entry . Patients with medication overuse headache (MOH) were allowed in the study [26, 41]. Days of acute drug use per month ranged from 15 to 16 in one study  whereas mean 28-day days of use of any acute headache medications was around 13 in the other study . The phase III RCT on galcanezumab in CM excluded patients who had no therapeutic response of > 3 preventive medications . OnabotulinumtoxinA injections were prohibited during the study. Patients who had failed 2 or 3 previous preventive treatments represented 24–35% of the study population. Patients with MOH were allowed in the study and represented 63–64% of all the study population. In this study patients without headache free days were excluded. In EM, CGRP mAbs were evaluated both in patients with and without previous drug failure. So far, in most of the available phase II and phase III RCTs, participants with previous failure of as few as 2 preventive medication classes for migraine were excluded. This implies that efficacy can be different for patients with severe, treatment-resistant migraine. Only in the LIBERTY study on erenumab 140 mg monthly patients treated unsuccessfully with between two and four preventive treatments were included. The study confirmed effectiveness of erenumab in this subgroup of patients. However, no results were provided for patients stratified according to previous preventive failure versus non tolerability. In CM, erenumab, fremanezumab, and galcanezumab were evaluated both in patients with and without previous drug failure. Data on erenumab indicated that the drug is effective even in patients with failure to previous drugs. Patients who had previous use of onabotulinumtoxinA were included in RCTs but no information referring to previous efficacy of onabotulinumtoxinA and response to study treatment is available. Erenumab, fremanezumab, and galcanezumab were not evaluated in patients with CM refractory to current available medical treatments. However, due to the poor quality of life of patients with refractory CM it is reasonable to treat them in daily clinical practice with erenumab, fremanezumab, or galcanezumab. Post-marketing studies are needed to provide information about efficacy of CGRP mAbs in refractory CM. Costs of the CGRP mAbs are not yet entirely known but they will be higher as compared to costs of the other available drugs. Pharmacogenomics studies should provide analyses to consider the economic impact of those drugs taking into account the overall direct and indirect costs related to untreated migraine or to migraine treated with the available drugs. Differences in reimbursement and regulations among countries will probably be present. Efficacy, safety, good tolerability profile and ease of use may represent advantages of CGRP mAbs drugs which may lead patients to prefer those drugs as first-line options. Rather than only efficacy, CGRP mAbs have advantages referring to side effects and treatment administration. Poor response in patients with migraine may also be attributed to lack of compliance to available medical treatments because of the need of taking multiple doses of the drugs or side effects. CGRP mAbs may represent suitable options for patients who have contraindications to other preventive treatments because of comorbidities or side effects and in patients who have poor compliance to other treatments where strategies to improve compliance have failed. However, due to high costs it will not be possible to offer those drugs to all patients with migraine requiring preventive treatment. At the moment, limiting prescription to patients with prior drug failure may represent a reasonable option until pharmaeconomics studies will provide more data. It is important to point out that patients with multiple drug failures were mostly excluded by RCTs. It is important to note that early treatment of patients with high frequency EM may prevent CM with important impact on individuals and society. Final recommendations based on experts’ opinions are reported in Table 19. 1. When should treatment with anti-CGRP monoclonal antibodies be offered to patients with migraine? 2. How should other preventive treatments be managed when using anti-CGRP monoclonal antibodies in patients with migraine? 3. When should treatment with anti-CGRP monoclonal antibodies be stopped in patients with migraine? 4. Should medication overuse be treated before offering treatment anti-CGRP monoclonal antibodies to patients with chronic migraine? 5. In which patients anti-CGRP monoclonal antibodies are not to be used? 6. Should binding and/or neutralizing antibodies be monitored? How should other preventive treatments be managed when using CGRP mAbs in patients with migraine? Summary about concomitant preventive treatments in the RCTs is available in Tables 1 and 2. In the RCT with eptinezumab, preventive drugs were not allowed . In the phase II RCTs on erenumab in EM and CM preventive treatments were not allowed [44, 45] whereas in the phase III RCTs preventatives were allowed but a low proportion of patients (2–7%) had concomitant use [35, 36]. All RCTs on fremanezumab allowed the inclusion of those patients [26, 27, 34, 41]. Concomitant users of preventive drugs ranged from 20 to 34% for EM [27, 34] and from 20 to 43% for CM [26, 41]. Notably, a sub-analysis of patients using fremanezumab as an add-on treatment  and pooling together data of patients with EM and CM showed that among patients who received fremanezumab as add-on to their preventive treatment there was a significant decrease in the number of migraine days relative to placebo (− 4.1 versus − 2.5), an increase in the number of patients who had improvement by 50% or more of migraine days (40% versus 24%; P = 0.0505) and a reduction in the mean number of days using acute medications (33% vs 26%). Patients who were taking oral preventive drugs were not included in the RCTs on galcanezumab in EM [33, 42, 43] but were allowed in the RCT in CM . We have scarce information on how to manage other oral preventive treatments in association with anti-CGRP mAb in patients with migraine. No interaction is supposed by CGRP mAbs and available preventive treatments. Data on erenumab and fremanezumab suggest that the two drugs are beneficial also when added to ongoing oral preventive treatment. Combined use of other prophylactics and CGRP mAbs may be considered in patients with insufficient response to a single type prophylactics. If patients are on preventive drugs that do have some but not sufficient effect, anti-CGRP antibodies can be added because no interaction is expected. When a possible efficacy of anti-CGRP mAb is established in a given patient it should be discussed with the patient whether withdrawal from the oral prophylactic drug should be tried. In patients with CM, it is reasonable not to stop current ongoing migraine preventive drugs in patients before initiating the use of erenumab, fremanezumab, or galcanezumab in order to avoid possible rebound effects. Withdrawal of other preventive drugs may be done later in patients showing favorable clinical response after starting anti-CGRP mAb. A further point is to clarify, in patients with CM who had favorable response to anti-CGRP mAb but who may continue to experience a significant burden of migraine attacks if adding-on any preventive strategy may further improve attacks frequency, attacks severity, use of preventive drugs and quality of life. At the moment, no such information is available but it is reasonable to allow the use of additional preventive drugs where prevention with anti-CGRP mAb is still considered not optimal. No information on current use of erenumab, fremanezumab, and galcanezumab with onabotulinumtoxinA is available and this association is not supported at the moment. For those patients who are on botulinum toxin and who show an inadequate response, withdrawal of onabotulinumtoxinA with start of the anti-CGRP mAb may be considered. While in the trials there were time restriction referring to onabotulinumtoxinA withdrawal and start of the anti-CGRP mAb, they represented procedures to avoid confounders and are not reasonable in daily clinical practice. At the moment, we do not know whether it is reasonable to consider combining onabotulinumtoxinA with anti-CGRP mAb in patients who have a suboptimal response to each of those drugs. When should treatment with CGRP mAbs be stopped in patients with migraine? For eptinezumab duration of treatment in the available RCT was 3 months . For erenumab in available RCTs duration of treatment ranged from 3 months to 6 months for EM and from 3 months to 3 months for CM [35, 36, 44, 45]. In the open-label extension of the phase II RCT in EM in patients who had completed the 1-year open-label follow-up, persistent benefits were reported for patients who continued treatment up to 1 year . There was a fatal event related to atherosclerosis and a non-fatal myocardial ischemia in patients treated with erenumab 70 mg . The fatal event was considered not related to erenumab while for the other event conclusion was uncertain. A post-hoc analysis of data form the STRIVE and the phase II study in CM, showed evidence of onset of efficacy of erenumab during the first week of treatment . At week 1, 43% of EM patients and 26% of CM patients in the erenumab 140 mg group experienced a ≥ 50% reduction in weekly migraine days (15% increase vs placebo for EM and 10% increase vs placebo for CM). For fremanezumab duration of treatment was of 3 months in all the trials in EM and CM [26, 27, 34, 41]. A post-hoc analysis of patients treated with fremanezumab in the phase II studies indicated that fremanezumab may be associated with sustained efficacy in a substantial percentage of those who show an initial response; sustained response is less obvious in patients with CM than in patients with EM . For galcanezumab duration of treatment in available RCTs in EM was from 3 up to 6 months [31, 33, 42, 43]. A pooled analysis of data on galcanezumab in patients with EM (EVOLVE-1 and EVOLVE-2 parallel studies) or CM (REGAIN study) examined the likelihood of response with continued galcanezumab treatment in patients with EM or CM without initial clinical improvement . In patients with EM having “modest” early improvement at month 1, 62% achieved “good” and 20% achieved “better” responses with continued treatment. A percentage of patients with “limited” (43%) or “minimal/no” (34%) early improvement, or “worsening” (20%;) achieved a “good” response after continued treatment. In patients with CM, having “modest” early improvement, 38% achieved “good” and 13% “better” responses with continued treatment. A “good” response was achieved for a percentage of patients with “minimal/no” early improvement (17%). Similar patterns were observed for those without clinical response at month 2, though percentages were lower. An open label study which evaluated safety and tolerability of galcanezumab 120 and 240 mg in patients with episodic and chronic migraine provided information on treatment at 1-year. In the study authors found high study completion rate (77.8%) supporting the tolerability of the study drug through all 12 months of treatment . In patients who completed the study, treatment compliance was > 95%. Furthermore, the percentage of discontinuations due to adverse events was low (< 5% combined doses), and few SAEs occurred (< 4% combined doses, and none considered related to treatment). A further analysis from this same study indicated that treatment with galcanezumab led to high levels of satisfaction and high levels of preference and less side effects versus previous treatments . As a general rule, treatment can be stopped if migraine is considered too infrequent to justify preventive treatment or if treatment is considered not effective. Data from the available trials suggest that the effective reduction of monthly headache or migraine days due to treatment with CGRP mAbs may be observed very early, after less than one month from the first dose. Data from RCTs suggest that patients may have additional benefits with continuation of treatment and that some patients who have worsening with treatment or who are considered non-responders may have improvement with continuation of treatment. For those reason it is reasonable not to stop treatment before 3 months even in the absence of a clinical response. Further studies are needed to better assess whether some patients might have even a more delayed response to CGRP mAbs, and to provide information about the durability of the response to treatment with CGRP mAbs. Further data are also needed to clarify whether the response may be sustained even after withdrawal of the CGRP mAbs. For the moment it is reasonable to manage the duration of treatment with CGRP mAbs not differently to other available preventive strategies and to continue it for at least 6–12 in patients who have beneficial effects with those drugs. Factors contributing to response/nonresponse have yet to be elucidated and clinical judgment should be exercised when deciding whether to discontinue treatment. Tachyphylaxis of preventive treatments for migraine is a frequent problem in the clinical setting. A post-hoc analysis of patients treated with fremanezumab in the phase II study supported a sustained efficacy, over the 3-month trial period, in a substantial percentage of those who show an initial response . One-year interim analysis of a phase II study of erenumab 70 mg suggest that benefits persist over time . Should medication overuse be treated before offering treatment CGRP mAbs to patients with CM? All the available RCTs on CM included patients with MOH [26, 31, 41, 45]. No subgroup analysis of efficacy and safety was performed for patients with MOH. We have no direct data about the impact of MOH on the treatment of CM with CGRP mAbs. However, the available RCTs of erenumab, fremanezumab, and galcanezumab all enrolled consistent proportions of patients with untreated MOH. Therefore, it might be reasonable to offer treatment with CGRP mAbs to patients with MOH. We have, at this moment, no evidence to indicate that the effect of CGRP mAbs is increased if preceded by detoxification and further research is needed on this issue. Some adopt withdrawal strategies before offering preventive medications to patients with CM and MOH and some of the available evidence indicate that detoxification is feasible and effective . However, detoxification is not easy and feasible with all patients and dedicated resources, which are not always available, are needed. We have no data which indicate if the use of CGRP mAbs may favor detoxification in patients with CM and MOH. Of note, the frequent use of butalbital-containing medications was an exclusion criterion from the trials; therefore, current evidence suggests avoiding the overuse of butalbital before starting treatment with CGRP mAbs. In which patients CGRP mAbs are not to be used? Criteria varied across trial but pregnant or nursing women, alcohol or drug abuse, cardio and cerebrovascular diseases, and severe mental disorders were the most relevant conditions. CGRP mAbs are unlikely to produce drug interactions or affect the course of ongoing disease which may be particularly relevant in patients with comorbidities. CGRP is the most potent vasodilator peptide known  and has been theoretically considered as dangerous in patients with diseases of the vascular system. In the cardiovascular system, CGRP is present in nerve fibres that innervate blood vessels and the heart and participates in the regulation of blood pressure . For this reason, patients with cardio and cerebrovascular disease were excluded from available clinical trials. In available studies, there is no evidence of increased cardiovascular events or any other serious concerns. However, the duration of available studies is much shorter than the duration in the clinical settings and registries should record any SAEs to see the long-term effects of continuous blockade of the CGRP pathway. Additionally, there was no effect on treadmill exercise time in patients with angina who received telcagepant, a small-molecule CGRP antagonist . These results supplement those from a placebo-controlled study of erenumab in a high-risk population of patients with stable angina with a median age of 65 years, in which inhibition of the canonical CGRP receptor with erenumab did not adversely affect total exercise time in a treadmill test, among other safety endpoints . Long-term safety studies with CGRP mAbs are needed to further characterize potential cardiovascular effects. More data from migraine patients with comorbid cardiovascular conditions in a real-world setting may help further assess the theoretical cardiovascular risk of blocking the CGRP pathway. Should binding and/or neutralizing antibodies be monitored? The occurrence of binding or neutralizing antibodies against the anti-CGRP mAb is reported in Table 20. It is important to note that some of the patients in the RCTs were positive for those antibodies before initiation of the study drug and that there were antibody positive patients even in those taking placebo. Data from individual studies indicate that binding and/or neutralizing antibodies occur infrequently and may have a variable course over time. At the moment, the presence of binding and/or neutralizing antibodies has not been associated with poor response to treatment or adverse events. Consequently, there is no evidence which may support the need of antibodies testing in routine clinical practice. However, this issue should be further studied. In fact, duration of treatment in available studies is limited in time and it cannot be excluded that the rate of occurrence of binding and/or neutralizing antibodies in available clinical studies was too low to establish firm conclusions about their possible implications. Pooled data from available RCTs or data from real life studies may add better evidence and further research should clarify the role of binding and/or neutralizing antibodies in patients with poor clinical response and side effects. CGRP mAbs appear promising drugs for migraine prevention. Real-word data will be very important to support efficacy and safety of those drugs particularly in the long-term. Future biomarker research should identify patients more prone to respond to CGRP mAbs and enable clinicians to personalize treatment decisions. Dimos-Dimitrios Mitsikostas and Paolo Martelletti contributed equally to this work. We thank Diana Degan, Raffaele Ornello and Cindy Tiseo for their support in the literature search and evaluation of the quality of evidence. This work was supported by a grant from the European Headache Federation. There are no original data. SS and PM had the original idea of the consensus paper. SS performed the systematic review and drafted the manuscript. SS drafted the recommendations. All other authors participated in the development of the consensus, revised the manuscript and the statements for intellectual content. Each author participated sufficiently in the work to take public responsibility for appropriate portions of the content; and agreed to be accountable for all aspects of the work in ensuring that questions related to the accuracy or integrity of any part of the work are appropriately investigated and resolved. All authors read and approved the final manuscript. Ethics approval and consent to participate was not needed for this consensus. All authors have reviewed the final version and gave their approval for publication. Authors, Financial disclosure (consulting, speaking fees, travel grants, research support). Simona Sacco Allergan, Bayer Healthcare, Eli Lilly, Medtronic, Novartis, TEVA. Lars Bendtsen Allergan, Biogen, Novartis, Teva. Messoud Ashina Allergan, Alder, Amgen, Eli Lilly, Novartis, Teva. Dimos-Dimitrios Mitsikostas Allergan, Amgen, Cefaly, ElectroCore, Genesis Pharma, Eli Lilly, Merck-Serono, Novartis, Roche, Sanofi-Genzyme, Speficar, Teva. Uwe Reuter Amgen, Autonomic Technologies Eli Lilly, Novartis, Teva. Gisela Terwindt Eli Lilly, Novartis, Teva. Paolo Martelletti Allergan, Amgen, Electrocore, Eli Lilly, Novartis, Springer HealthCare, Teva.